Office layout design reflects the corporate culture and mission. Before you start your office layout design, you should think clearly what type of atmosphere you want to achieve. Office layout maker helps you to create the most suitable office layout for your company by providing massive office layout symbols. Many people spend a majority of their time at work and inside an office. The office environment is one important factor that can affect the employee's work productivity. Therefore, office layout is an important part of your overall business culture. A good office layout design is not only functional, but provides comfortable work areas for your staff. 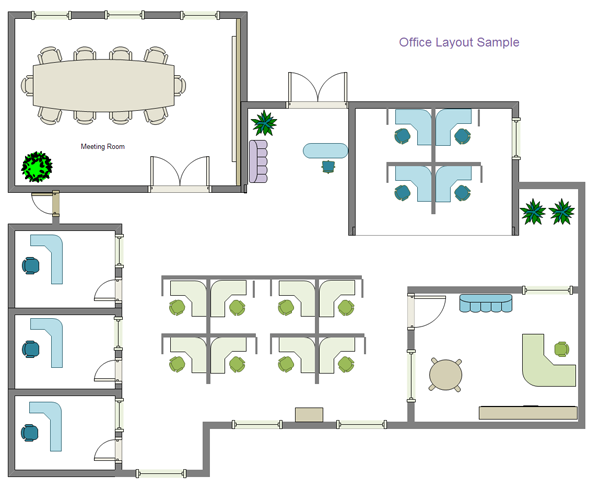 Office layout deals with the design and set up of an office. It takes into account all the accessories and equipment needed in an office. Employees are more productive when the design and layout of an office coincide with their working needs. The layout of an office should be constructed so that employees are able to function efficiently and effectively. 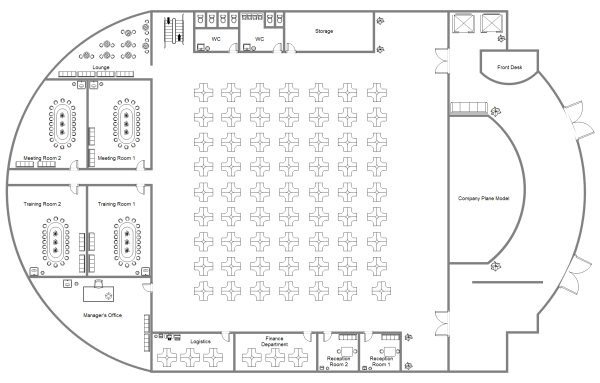 An effective office layout groups people together based on the functions they perform. For instance, it might make sense to group employees who process invoices close to your accounting and purchasing departments, so that these employees can consult with each other as needed. An effective office layout provides employees with the space and tools they need to complete assigned tasks. Work surfaces should be large enough to accommodate files, papers and other documents. The use of comfortable chairs and adequate lighting may reduce muscle aches and eyestrain, which can hurt productivity. An effective office layout should ensure that everyone has easy access to equipment, such as copiers, fax and printers. Any electrical cords should be out of the aisles to prevent employees from falling and tripping. An office layout has to take into consideration expansion and growth needs. The layout of the office space should reflect the needs of the employees. A good office layout is one that fills the needs of the worker and increases productivity. The following standards are the objectives of the office layout. ensure proper and effective utilization of space. ensure steady and effective workflow. facilitate for better supervision and control. provide comfort and satisfaction to employees. provide safety to office employees. include provisions for future expansions. Many things go into planning an office layout, including the lighting, desks, work stations, furniture and the amount of space needed, conference rooms and storage space for supplies. An efficient office layout promotes employee satisfaction through the ease at which they can perform duties. A layout that eliminates the need for redundant movements or unnecessary task completion toward common goals helps employees to feel more accomplished. An efficient office layout is more organized and facilitates the team make new hires. These offices are better suited to change, as the space can be manipulated without compromising current productivity. An efficient office layout boosts employees' overall job satisfaction. An efficient office layout also facilitates ease of supervision. A manager or supervisor will have little difficulty focusing on his work, but will still be available for employees to ask for assistance. An efficient office space means the manager can easily check productivity and move through the space fluidly. 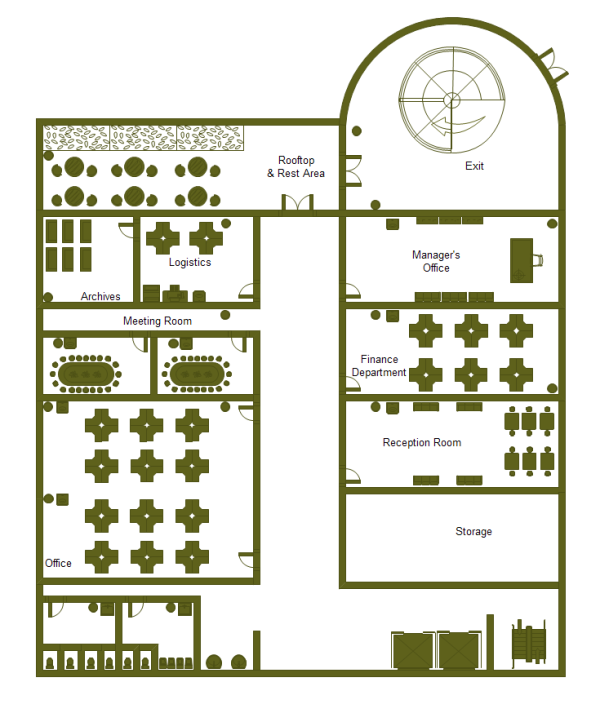 Before you start to draw an office layout, you may check out how to draw floor plan here. We believed that passage will be of great help when drawing office layouts.